We know as well as you do that you can’t trust everything you read online. 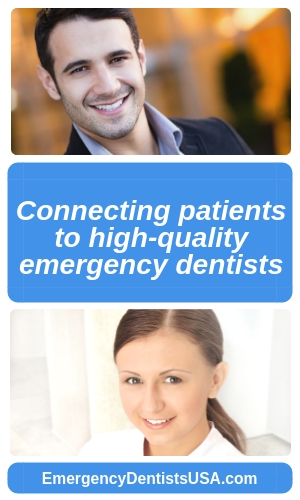 With so many different Dental Blogs available, why should you trust Emergency Dentists USA? This page will attempt to answer that question by clearly laying out our Editorial Guidelines for writing content as well as for vetting the dentists we recommend as Featured Partners. Although our articles are written by a staff of experienced writers and dental marketers, every piece of information you see on the Dental Blog was vetted by one or more of our three expert dentists. 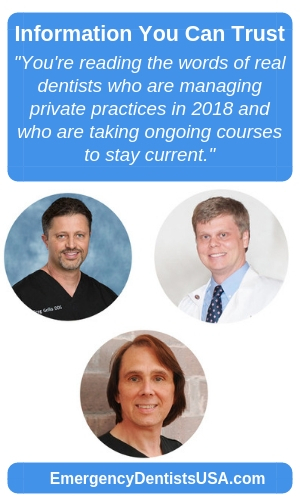 At Emergency Dentists USA you’re not reading the opinion of some anonymous Internet blogger on our site – you’re reading the words of real dentists who are managing private practices in 2018 and who are taking ongoing courses to stay current. Moreover, all of our dentists (and our entire staff) have biographies on our About page, so you can know exactly who’s writing our content and where their expertise comes from. Furthermore, any statistics we cite are carefully sourced from reliable publications. These include nationally recognized medical references, government agencies, and peer reviewed medical articles. If we can find information from the American Dental Association (ada.org), that is our preferred source of information on all things dentistry. You should never have to just “take my word for it” when it comes to your dental health. Each article will feature links supporting our findings and you’ll see exactly where we’re getting that information. You will always be able to decide for yourself whether or not our content comes from a reliable source. We think you’ll find that it always does. In addition to providing information through our Dental Blog, the primary service of Emergency Dentists USA is to connect patients to high-quality emergency dental care through our helpline and with our online directory of dental partners. How do we ensure that our customers are getting the best possible emergency dental care we can find? A dentist who meets these qualifications can then apply to be featured on our website. From here, our team works with our expert dentists to vet these potential partners. We look at their history and the types of services they offer – we want to make sure that they’re providing a modern dental office with up-to-date treatments and procedures. And we always speak with the dentists we feature in order to get a feel for their personality as well as their mission. Once we and our experts are satisfied that this potential partner is a legitimate dental practitioner who provides good care at a reasonable price, we add them to our listing and begin recommending them to patients in their area over our helpline. Since our founding in 2013, our mission has always been to provide our customers with the best possible dental care at their exact moment of need. We know that we can only accomplish this mission by being transparent about our guidelines and by going to extreme measures to verify the accuracy of everything we post on the site. That is why we follow these guidelines: because if we’re not taking care of our customers, we’re not taking care of our business.